This was a nice gift; however, we did not want middle initials. The personalization was not adjusted to show this, so there is one initial, a space, and the last initial. It makes it look like it was made incorrectly. Other than that, it's nice. I filled these flasks with my favorite scotch and gave them to my groomsmen. They loved them! Great gift idea. 5"L x 3"W, 5 oz. 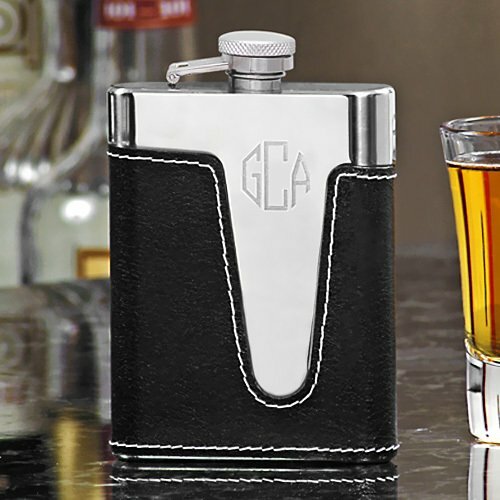 Bring the party with you wherever you go with this elegant engraved flask. The black leather flask sports a modern design and includes a 3-letter monogram. The perfect gift for your groomsmen or favors for the bachelor party. Each flask measures 5" x 3" and holds 5 ounces of liquid. A hexagonal monogram may be engraved on the upper right hand side if desired. 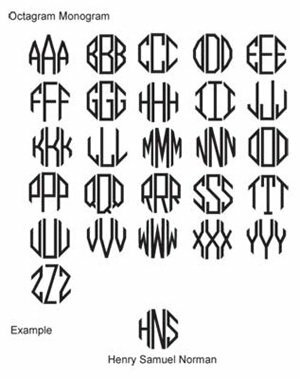 When entering 3-letter monograms, please enter in this order: First initial, last initial, middle initial (last initial will be larger, in the center). See font chart to the left for layout.